On June 5, the United States Mint and the National Park Service will introduce the quarter commemorating Missouri’s Ozark National Scenic Riverways. This year’s third quarter ceremony will be at one of the historic sites within the national park, called the Alley Spring and Mill. Alley Mill, a steel roller mill built in 1894 to convert wheat into flour, is depicted on the quarter’s reverse. There are two related events supporting the official release. There is a coin forum on the evening before the ceremony, and there is a coin exchange immediately after the ceremony. All three events are free and open to the public. 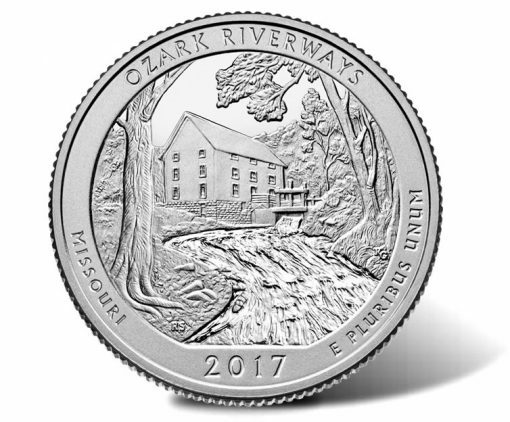 Ozark Riverways quarters also enter circulation on June 5, but it can take months, possibly years, before they’ll appear in regular change. That’s because the Federal Reserve System distributes coins to financial institutions without regard to their designs. The official ceremony offers an early opportunity to get this particular one of five 2017-dated quarters. The United States Mint offers another opportunity by selling them in rolls and bags. Quarter ceremonies are unique events for locals, coin collectors, and children. They can last 30 to 40 minutes, while various speakers provide background about the historical site, local entertainers perform, and then official dignitaries unveil the new coin. Children age 18 and younger will receive a new Ozark Riverways to commemorate the event, free of charge. The coin exchange, sponsored by Security Bank of the Ozarks, begins immediately after the ceremony. Anyone attending the ceremony can stand in line to trade cash for $10 rolls of the new quarters. There is a one-roll ($10) minimum and a 10-roll ($100) maximum. A coin collector forum, hosted at the United States Mint, will take place the night before the ceremony. These forums offer everyone an opportunity to meet people from the U.S. Mint and to learn more about coins. Questions are encouraged. Coin forums usually only last about an hour. 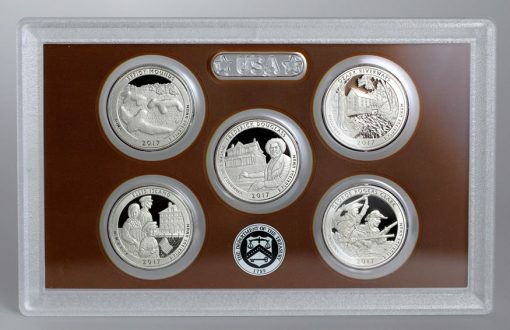 As mentioned earler, on Monday, June 5 starting at noon ET, the U.S. Mint will begin selling Ozark National Scenic Riverways quarters directly to the public. Product options include Mint-branded 40-coin rolls, 2-roll sets, 3-roll sets, and 100-coin bags, and their prices range from $18.95 to $46.95. They will be available to order online at catalog.usmint.gov. These product releases will also be covered here on CoinNews. In February, the quarter honoring Effigy Mounds National Monument in Iowa was released. It was followed in March with the Frederick Douglass National Historic Site in Washington, D.C. The two upcoming 2017 quarters celebrate Ellis Island (Statue of Liberty National Monument) in New Jersey and George Rogers Clark National Historical Park in Indiana. The U.S. Mint launched in January collector proof versions of all five 2017 quarters for $14.95. These coins feature frosted designs on mirror-like backgrounds. Sales of proof editions in silver started on Feb. 16 for $31.95. This year’s uncirculated set of quarters was released on April 10 for $12.95. Uncirculated quarters look most like those found in circulation, but tend to be sharper and more brilliant. Thanks for the update. The two maps you have in this article are for the last ceremony in Washington DC instead of the Missouri one. Also, there was major flooding at the Missouri park in late April causing major damage that is still being repaired. The Mill pictured on the coin had over a foot of flood water in the main building & one of the large lodges had water up to the roof! The Mint is hoping it will all be repaired by June 5th for the events. Thank you! The maps were my mistake. I like to keep the same formatting (sizes) and pasted them from the last article. Fixed! !